Gravity will no longer matter when you play as the latest addition to Super Meat Boy. Super Meat Boy is becoming like the bar where all the indie cool kids hang out. The game already features secret playable characters from independent titles such as Braid and Gish, but future versions will inflate that indie roster even more. The Minecraft guy was recently confirmed for the Super Meat Boy roster on the PC, and now the main character from VVVVVV is planned as well. Team Meat tweeted this week that Captain Viridian from VVVVVV will be gracing the PC version of Super Meat Boy when it's released later this year. The indie duo of developers accompanied the announcement with the image of Viridian's unlock art that'll be used in the game. Aw, he looks so sad. Viridian might be one of the coolest additions to the Super Meat Boy roster simply because of his powers. Super Meat Boy's secret characters aren't just skins, they also retain some of their unique special powers for use during gameplay. For example, Gish can stick to walls, while Super Meat Boy himself cannot. 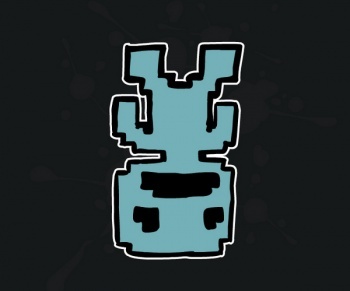 In VVVVVV, Viridian has the ability to switch the direction of his own gravity to stick to the ceiling, or vice versa, at will. Because of Viridian's potential to easily bypass portions of Super Meat Boy's levels, Team Meat later tweeted that he'll only be unlocked after players collect a "ton" of bandages, collectible items found in most levels. I really like how Super Meat Boy doesn't simply alter the main character's powers, and instead highlights other independent games worth taking a look at while giving people new ways to tackle the game's levels. I've been enjoying the Xbox 360 version of Super Meat Boy, but I'm starting to think I'll have to buy the game again on the PC just for the planned level editor and the ability to play as my favorite frown-faced gravity bender.